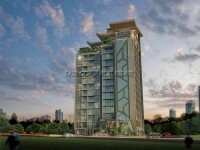 This 4th floor condo is located in the popular Cliff Condominium in the Cosy Beach area of Pratumnak Hill. It is a fantastic 1 bedroom unit and keenly priced to attract a long term client. The unit comes fully furnished as the pictures show and is on the mountain side of the building so it does not get the strong afternoon sun shinning into the unit. There is a Euro kitchen, good sized bedroom with ample storage, quality bathroom with washing machine installed and a nice living area with direct access to the balcony. The building has a resort style swimming pool, gym, playground, Jacuzzi and 24 hour security. Long term rentals only. The property is held within a Thai Company, and is priced to include this.